A second off-grid lighting product from Niwa – Next Energy Products Ltd , the Uno 50, has met the rigorous Lighting Global Quality Standards. 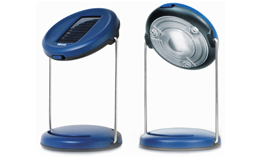 The Uno 50 is a compact, durable, and portable lighting product with an inbuilt solar module. It comes with a stand that makes the product ideal as a task light e.g. for reading. The product’s design makes it versatile enough to be hung on a wall or ceiling to also serve as an ambient/room light. The Uno 50 has a two-year warranty and has two different brightness settings. After a full day of charging in the sun, the product can run for about two hours at its brightest setting, and on its standard setting, it runs for about five hours. The Niwa 300 was Niwa’s first product to pass the global Quality Standards for modern off-grid lighting products.